00:02:00 Kateigaho Magazine Text In order to appreciate the inner garden, knowing the self is the first step. 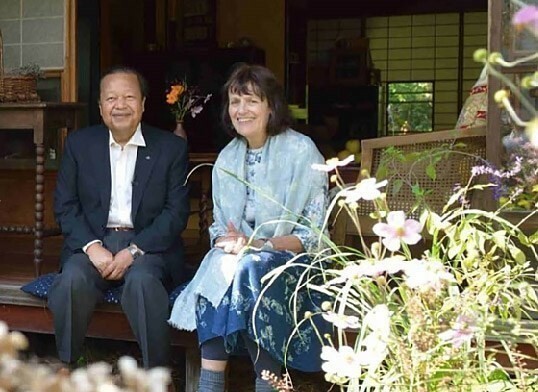 Venetia Stanley-Smith in conversation with her lifelong friend and teacher Prem Rawat. Venetia: Prem, you often liken the heart to a garden. I’d like to hear more about the similarities between a garden and the human heart. Prem: A garden is a very interesting place. Like your garden here, it wasn’t pre-determined what would grow here. If you don’t do anything, weeds will grow; if you look after it, beautiful flowers will grow. Thorns could grow or herbs could grow. The garden holds the potential for both. Venetia: This example of the garden can also be applied to the heart or what you might call the inner garden? Prem: Absolutely. The starting point is to understand how your own inner garden looks right now. In other words, to know the self. From that foundation of knowing the self, next you need to realize that just like the external garden, what will flourish in the garden of the heart is not pre-determined. It is an open book. Understand that you have been given a gift of time to be alive, that you have a heart and it needs to be cared for. Then you can start to make your inner garden beautiful. With self-awareness, understanding the potential that the garden of the heart holds, you will be able to sow the seeds that will benefit you the most. Then you will have a garden you can enjoy for the rest of your life. 00:22:00 Positive News - Read Text When the life isn’t right, nothing else falls into place. Good afternoon, Mr. Rawat, and a very warm welcome. Thank you for having me, and it’s great to be here. Lovely. So, you are an international speaker who presents a practical perspective about the business of life. Why the business of life? Because we’re involved in so many other businesses—businesses of raising a family, businesses of going around doing whatever we do. And why don’t we focus on the business of life? Because we are alive, and that is the most, absolutely the most important thing. And when the life isn’t right, nothing else falls into place. When life isn’t happening, when you don’t feel alive, then everything else just seems so static. And so, yes, the business of life—understanding the business of life, getting that business of life perfected—for having everything, everything, in this time that we have on this precious earth. And so, how important is it for one to have a balanced life, and what would you say that is? Well, the question is, life will be balanced if those forces that throw it out of balance are removed. Because life wants the balance. There is a joy; there is a want for joy; there is a want for happiness. You know, nobody goes to a church or a temple to pray and saying, “Well, I’m too happy.” You know, “Remove some of this happiness.” Because we don't have a limit for how happy we can be. But for sadness, for fear, for anger, for pain, we definitely have very low tolerance. And so that, right there, is telling us something: go ahead and let that joy of being alive, being here, being now, being happy, being satisfied, being successful, let it all come! Let it all come! Make it happen! And that’s the business of life. So, well, happiness is just but for a while, but joy is what you want to achieve. How do we get to that point? Well, this is a very, very beautiful question, because I think that’s at the crux of so many things. What…what is happiness? A lot of people think that being prosperous, that’s happiness. And they look at prosperity as just one thing, which is, make a lot of money. But that’s not actually prosperity. Prosperity also includes good health, and also includes that you are happy with what is happening in your life. To be happy, we need hope. To be happy, we need gratitude in our life. To be happy, we need self-reliance—not always thinking of what other people are thinking of us, but what we think of ourselves. And to be happy, we also need to know ourselves—the very thing, many thousands of years ago, that Socrates said, “Know thyself.” It’s still true today, and maybe even more true today than at any given time. Because we need to know who we are, what our needs are—what we really, really need—and we are so confused about our wants and our needs. We think that our wants are our needs! That’s not true! There are things that we need, and without those things we wouldn’t even be alive. But, you know, we go on the tangent of, “Oh, yeah, this would be nice to have; this would be nice to do; this would be nice to have in my life.” That’s okay! But really, you have to understand what is important. And important is you, you being fulfilled. An unlit candle cannot light another candle. It doesn’t matter what happens. So, you are a lit candle, then you can light other unlit candles. So, would you say that living a purposeful life would then result to one living a joyful life? The joy will come from within you. You cannot create the joy. You cannot invite the joy, to say, “Okay, now I’m ready for you.” When all is right, it is like a flower blooming. When all is right.... You sow the seed, fine. You water it, fine. But then, when the season comes, that seed will germinate. And all the things have to be right for that seed, regardless of the time. But if everything is right, it will happen. And joy is the same way; happiness is the same way. You know, there is the happiness that we get that is so temporary. But then there is the happiness that really comes from our heart. A smile because we met a stranger—and a smile when there’s nobody around, and that smile is still there. And that, to me, is the important smile—not the smile of manners, not the smile of external gestures. All right. And so, for any of you charged on prosperity—what would you say is true prosperity? True prosperity is where there is a balance for fulfillment of your dreams, balanced with the fulfillment of your needs—and, at the same time, good health. I mean, look at what’s happening to people today. You know, they work, work, work, work, work, work, work to become rich. And then they retire and all the money they have earned, they literally give to the hospital, so that they can be cured of the disease that they have accrued trying to make all this money. And that’s no prosperity at the end of the day. Prosperity is a full heart—not just a full pocket, but a full heart. And you will never feel prosperous unless your heart is full too. And it also requires that you be in peace, that you are stable, that you are good. You know, if you’re sitting in a train and the train is jockeying back and forth, and you’re trying to hold a pot full of water…the thing is, it’s going to be very difficult because you are shaking—so is the train, so is the pot, so is the water. And if you really want that stability, something has to go stable. In your life, you are the base of your existence, and you have to become stable if you want that pot full of water to be stable. But if everything is just jockeying and jockeying and jockeying, it’s going to be difficult; it’s going to be impossible. So, you do mention that, in order for one to understand the business of life, there has to be some storytelling that happens somewhere there. Can you just take me through this? And how do you link the two? No, the thing is, not just ideas, not just beliefs—but this has to be about knowing, knowing yourself—not believing you could do this, not believing that this exists, not believing—because…You know, one example I give is like, you’re sitting somewhere and you make believe there is a cow. And so, five people are there or whatever, and they go, “Yeah, yeah, okay, there is a cow”—because it’s all make-believe, there’s no harm done. But if you want milk for your tea, the only kind of milk the make-believe cow can give is make-believe milk. Now, if you want real milk, it’ll have to be a real cow, not a make-believe cow. And that’s the same thing in life—that we believe in so many things! People say, “Believe in yourself.” I say, no, that isn’t going to help. What you really need to do is know yourself. How do you get to that point of knowing yourself? And everybody is discovering that there is such a dimension to themselves, that they are not limited by their own imagination—but there is a whole dimension to understand. That there is a courage in you. And you get in touch with that courage; you get in touch with the joy that is in you; you get in touch with that understanding that is in you. And when you start to actually, not just believe in these things, but feel every day, the courage that you have, you start to understand who you are. That the components that bring you together, that make up what you are, are powerful, powerful. Kindness is in you, all the time! You know, look at me. For fifty years I’ve been talking about peace. And everywhere I go, people go, “Oh, it’s not possible. It’s not possible.” And I just ask them one question—“Okay, so it’s not possible. What is our choice?” Without peace, the fabric of society is going to fall apart. We are falling apart. Nothing is gluing us together. And this falling apart is getting worse every day. We’re killing people who have done nothing wrong. [Interviewer: Umm-hmm!] And we are fueling the fire of revenge. Little children who are orphaned have hate—hate and hopelessness—in their eyes, when those little eyes should be full of hope, should be full of joy. And so, we have no choice but to court peace in our lives. So, the message of peace that you are spreading, how has it been received? Well, people who understand it... and believe me, I respect this in people, because it requires a change in thinking…people have been thinking a certain way, “It’s not possible.” And, you know, the thing is, I actually respect them for that. Because, yes, you have looked at the horizon and there is no ship out there. And so you feel alone and you feel desolate. But one of the things that we have not done is look at ourselves. We have looked at the world; we have looked outside, but we have not looked on the inside. And when we start to look on the inside.... And this is the message—that it’s not just my message—this is the message that has echoed through the years, through the ages, from one civilization to the other civilization. You know, and another way to just look at this is that, a long time ago we came out of the jungle. We were all in the jungle, and we came out of the jungle and we started the practice of farming. Farming not only brought us all kinds of different things, but it brought us the very thing we called civilization. Pretty soon there is going to be no difference between civilization and the jungle. And all that transformation of going from the jungle to civilization would have been for nothing. And this is what’s happening everywhere you look. Little fish are trying to be big fish. You look at bullying—which is such a crucial problem starting to appear in this world—and what is that bullying? Bullying is, just for a very short period of a little time, the little fish wants to experience what it is like to be the big fish. [Interviewer: Hmm!] And yet, the rule of the jungle is, you do that and you will get eaten. So now, tell me, you are on the 16 Days of Activism tour to South Africa. Why this tour? Can you just talk us through this initiative? And I was actually asked that, you know, “You cannot have mixed meetings…that you have to have separate meetings, you know, for separate color.” And I said, “Sorry, I’m not going to do that.” And the consequence of that was that I was blacklisted! Of course, they didn’t want to do anything to me because it would have caused a major incident—because, arresting a teenager....So I was followed everywhere I went. I was blacklisted. When I applied for my visa to come back to South Africa, it was denied. And it was only after the apartheid started to dissipate that I could start coming back to South Africa. But forgiveness is for you to make a decision that you don’t want to still continue being hurt by the actions of that person, and you want to move on; you want to go on. You are exercising your power to move forward, rather than to try to accept the mistakes of another person. That’s lovely. And so you started on the 6th, and it’s ending on the 15th, the tour, right? [PR: Yes.] How has it been so far, from the day that you’ve covered? I…I have to tell you, you know—I love it; I love it. Because when I tell people these things.... And what I’m really bringing to the people is fifty years of my experience. You know, I started speaking about peace when I was four years old—at nine years old I actually had to shoulder the responsibility—my father passed away. And, whatever he was doing fell on my shoulders to carry on. [Interviewer: Hmm, mmm.] And when I bring that experience, and the “aha moment” happens for people, you have no idea how amazing that “aha moment” is. Because it’s like, I have helped light another candle. And that person now has the capability of lighting another candle. 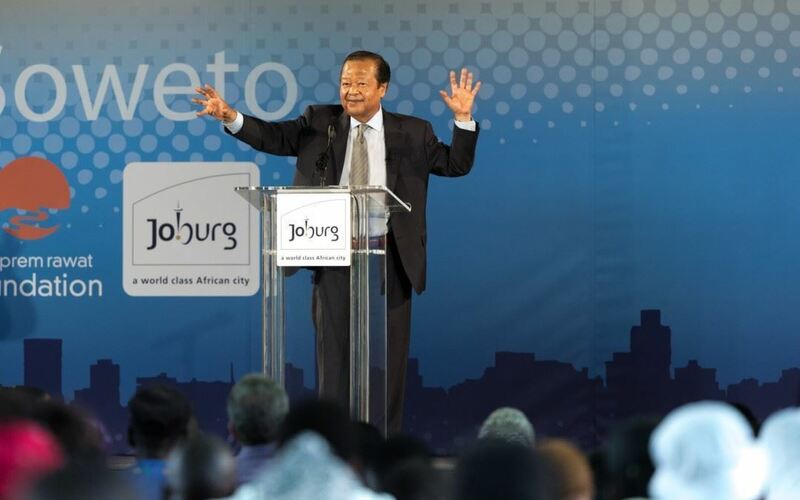 And I…I really see that South Africa can be a shining beacon in these stormy waters, for the whole world! I mean, South Africa has something incredible—if they could do it, they have something incredible to teach the whole world. That it is not just about money; that it is not just about fame; that it is not about those things, but it is about the humanity of human beings. The most separated come together. The most hated join hands for a better future for all of us, and our children, and our grandchildren, and the ages yet to come on this earth. Yeah, indeed. So, you are one of three leaders to receive the International BrandLaureate Lifetime Achievement Award—of course, alongside our former president elect, President Nelson Mandela, and Hillary Clinton of the U.S. How did this come about? Well, this person in Malaysia recognized what I had been doing. He had come, and he had heard what I had to say. And he also saw that the influence of what I was saying and the influence of what I was doing through my Peace Education Program was so powerful that he invited me to come. And, I mean, it was a surprise for me. I didn’t know I was going to get it. But, he invited me. And he’s a wonderful person, and a great friend now, of course—we have met many times now. And he wanted to present me with this award. And so I very gladly accepted. Lovely! And you are a man of many talents, eh? Even a successful pilot, I’m told. So, what do you enjoy doing the most? Is it music, photography? Is it art? When do you get to sing? I…I get to sing from my heart a song of life, [Interviewer: Uh-huh?] a song of joy, a song of certainty, a song of hope. [Interviewer: Mmm!] And, that is an incredible song. In my spare time I really like photography; I like cooking, and I like doing art. It’s just an expression of what I sometimes feel. So, you know, there’s many, many things but, really, what I enjoy doing is talking to people. Thank you so much Prem, for your time. It was really lovely chatting with you. Thank you so much. Thank you so much for having me. Thank you. You are welcome, and bye!